Back home from a harsh day at work, I ripped my suit off and frantically started wrapping a saree around myself. We were due to attend my brother-in-law’s best friend’s Gujarati wedding reception. On a Monday. In the depths of commuter countryside – Hertfordshire. Going out on a Monday night is difficult at the best of times. Wearing a saree, earrings the size of rocks and gold stilettos was pushing it just that little bit too far. Moan over, we dashed down the motorways to a Jain temple and community centre tucked away at the end of a country lane. Hubby gasped with surprise as he spotted a sign forbidding “non vegetarian food, alcohol and smoking”. His life was temporarily over. I, on the other hand, fidgeted nervously and shuffled along like a Geisha attracting glares from a 1000 aunties. I never did work out if it was the painstakingly hand-embroidered chiffon saree draped on my left arm or the bona fide white man on my right. We queued for food. And boy was it worth it. 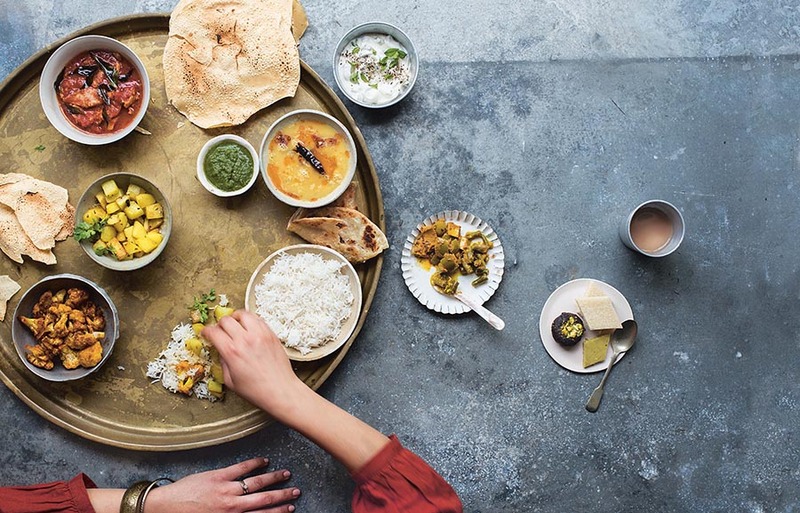 A platter with little compartments held a host of vegetarian treats – kadhi, dhokla, khandvi – and two achingly glorious sweets. Gujaratis are mostly vegetarians who avoid eggs, meat and fish. As Jains, they avoid using garlic and onions in their diets. Very strict Jains don’t even have potatoes or other root vegetables. This wedding featured a delicious spicy potato curry. I ate mine in a jiffy and started attacking hubby’s portion, attracting glares from the uncles this time. I decided to try and replicate it the following day. From my calculation, it used ginger and heeng, even a bit of sugar. And the result was surprisingly close to what we had eaten, but “not as spicy” according to hubby. This time he enjoyed it with a pint. Heat the oil in a pot over a high flame. When the oil is hot, add the heeng and the sugar. As the sugar caramelises, add the pureed ginger and fry it stirring until its colour changes to a warm golden. Then add the tomatoe puree and all the powders. Mix them well, frying the masala for five minutes until you can see the oil reappearing on the sides of the pot. Now add the potatoes and stir vigorously incorporating the masala into them. As the potatoes start going translucent around the edges, spoon in the yogurt. Make sure you use a very thick yogurt or it will split. Fry for about two minutes, mixing the masalas together. Then add the hot water, reduce the flame to a medium heat and cook covered, stirring regularly, until you can easily insert a fork into the potatoes. This will take a good 20-30 minutes but the potatoes will taste much better than if you pre-cook them. Serve them hot, with a vegetable pulao or rotis. you have a great site here, mallika. am adding you to our blogroll. >Gujaratis are vegetarians who avoid eggs, meat and fish. Shak – I’ve changed it to “mostly vegetarians” so I don’t hurt your feelings or anybody elses. I’m a Hindu but I eat beef regularly, so we are the exceptions. can you tell me how to make the perfect gujarati ‘bakris’ please? Wedding sounds wonderful – what great food – much better than the true-blue Aussie wedding I went to two months ago! Lovely recipe too – I shall be making this one. >Iâ€™m a Hindu but I eat beef regularly, so we are the exceptions. Er Shak – You are stating the bleeding obvious! What I meant was that Some Gujaratis are Jains who do eat eggs, meat and fish. Just like some Hindus eat beef, which is not common practice among them. Ok, at risk of totally pushing you off the edge: I guess I found it slightly irritating since all the many Gujarati Muslims I know (myself included) have none of these dietry restrictions, and I wouldn’t have thought that we were atypical or unusual or “exceptional” Gujaratis because of that. Apologies for not being clear and it’s no big deal anyway. PHEW!!! Finally!!!! Past few days my feed reader was not updating your posts and just two days back I was thinking how coem I haven’t heard from you off late…… and there I see your post on food blog desam! I guess my google reader is out for a toss!! Mallika – aloo turned out great – lovely recipe – hubby loved it and even Esha wanted to try Aloo for the 1st time since she thought the smell was “very disticious” (ofcoursre she meant “delicious”! Enjoy ur trip to Cannes – and write to me all about it…. hey, nice story and a good recipe. I enjoyed reading through both. And yeah, I’ve started eating beef since I came to canada and I do get funny comments from people around me who know I’m not supposed to eat beef as I’m a hindu. mmmmmm I’ve been craving like mad for some potato curry! yes, I am Croatian, moreover Dalmatian, and I haven’t eaten anything spicy until I was 16, but Indian food has got under my skin and into my heart! I simply adore it: the heat, the complexity of flavour, the variety! So much that when I spend a month in Croatia, like now, I crave it! All I want now is a simple and flavoursome potato curry. Like this one. Needless to say this is going straight to my bookmarks! Made this a few days ago – loved it! it smelled fantastic! this was the first time i cooked with hing, and it was a bit bitter. i either put too much, or i really shouldn’t have added some exta afterwards… i’ve read hing needs to be cooked in oil/ghee. would you mind if i blogged about this, including your recipe, too? of course, it will be duly acknowledged, with links to your post and all! Yum. It looks delicious. Cultural aspects really interesting too. The photo of the Gujarati Aloo looks delicious and The recipe is made up of all the spices of the east. What an inspiration that was from a hidden haven you visited in Oshwal Centre where there is a Jain Temple as well. I hope on a good day you will visit the temple and will experience a taste of peace and tranquility but there is no recipe for this . You have to experiance this by yourself , do walk round the landscaped gardens and rest on the bench and feel for yourself what a taste !!!!!! Oh my, these are absolutely delicious. I’m no fan of Gujarati food as such, but these potatoes won me over. Besides, they are ridiculously easy to cook. Thank you, thank you, thank you! Mallika, i have read three/four of your recipes and notice that you caramelise sugar a lot. Is that your unique style or some typical regional based cooking. 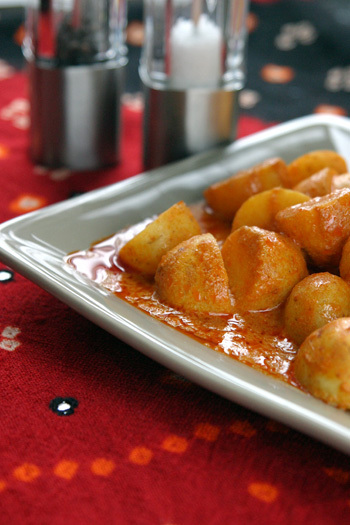 I am definitely going to make this aloo ka rassa. It has to be sprinkled with ratlami sev and finely chopped onion and a spoonful of desi ghee.